The Apache Chiefs just witnessed the induction of 22 new faces that will make themselves known during orientation and school functions year around. These will be TJC’s 2017-2018 apache chiefs. When asked about this new experience, a few of these incoming chiefs had passionate and anxious responses. “I’m looking forward to an awesome summer and community between the people that made it,” said freshman Hannah Sanders with a stretched grin. Freshmen Kaylee Phillips is taking on chiefs alongside band, a full course load in the honors program, and a job. But even though she might be busy, she believed the experience was essential. “I had to schedule out everything. My week is pretty tight. But I think that everything I’m involved in is completely worth it,” Kaylee said. Along with these new chiefs, there will be six returning faces to welcome the newer ones. Some of the freshmen chiefs had advice for the returners. “I think that returners help tie everybody together,” Justin said.Hannah said that she was hoping “for them to not necessarily take a leadership role above everybody else but to show the way that we need to go throughout the organization”. Last year’s Apache chief team set some of the highest marks ever witnessed by the organization winning an award for most spirit at a regional conference by competing and beating out major Texas universities like the University of Houston and TCU. The chiefs also won the distinguished organization award for at TJC. Last year’s team was also exceptional in their summer work. 90 percent of students that came to new student orientation were here on the 12th class day and 95 percent of students that came to orientation were registered for classes. 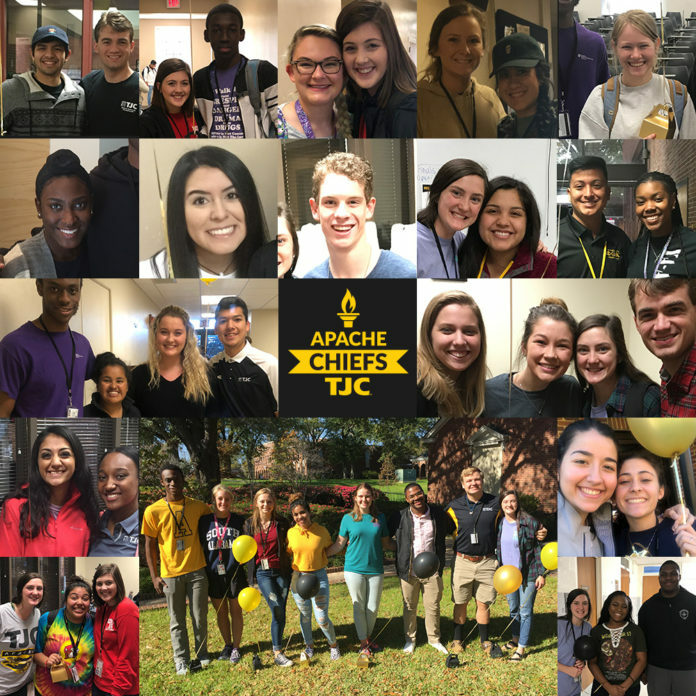 These numbers suggest that chiefs not only reached out to students during orientation but had a lasting effect in expanding the TJC community. This sets the bar for the new group. Their expectations have already been set higher than those of any previous incoming core of orientation leaders at TJC. With this new standard in mind, Murphy Turner, the team coordinator, responded with ways that he thinks that this year’s team can improve. “This year I really want to help our students stay in the program, so part of that was being a little more selective during the process, looking at some reasons why students didn’t make it from fall to spring [and] trying to eliminate some of those factors early on,” he said. The first and only two year returner J’bria Christopher had some advice to help the newcomers transition smoothly. She said “being open minded and taking everyone’s ideas and listening to everybody’s voice that they may or may not have” is a great way to begin. Former chief Courtney Slider also had some tips for the new chiefs that she remembered from her own experience. “My advice would be: don’t be shy because I was shy; it took me a little bit open up. Everyone is welcoming with open arms. Don’t be afraid to speak up because you think that you might not have a voice yet because you are new. Everyone has a voice; everyone has there own opinion; everyone deserves to be heard. The upcoming spring and summer orientation cycle will be the proving grounds for the new team, but their is no lack of optimism upfront. Freshmen chief Kaylee Phillips had no fear or lack of school spirit in anticipation for next year.